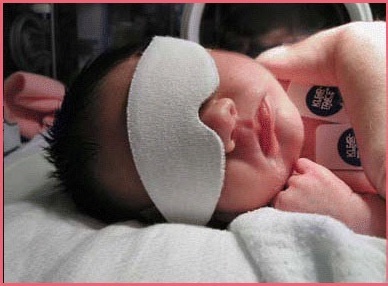 In 1980, newborn and NICU nurse, Gayle Cook developed the original strapless phototherapy Eye-Shield. While working in one of the largest neonatal nurseries in Southern California, Gayle spent much of her shift adjusting and re-adjusting the phototherapy eye protectors that were in use at the time. Those eye protectors were designed with straps that encompassed the babies’ heads. While performing her many other duties and caring for the babies in her charge, Gayle would notice two or three babies at a time who had shifted in such a way that their eye protectors were either not covering their eyes, thereby exposing them to dangerous ultraviolet light, or were alarmingly close to obstructing the babies’ airways. Confronted with this problem on a daily basis, Gayle designed a product that would provide the most comfort and safety for her newborn patients. She searched the nation for the safest adhesive and materials, hypo-allergenic and sensitivity tested for the neonate. In March of 1984, Gayle’s company, Russell Terry Medical Co., Inc., offered the unique, first ever patented strapless RTM Eye-Shield in 3 sizes and 3 colors. Because of the safety and ease of use they were enthusiastically welcomed by the largest hospitals and medical centers. Gayle then sought out distributors who had her same high level of commitment to the needs of the newborn and their care providers. Today Russell Terry Medical Co., Inc. continues their commitment to superior quality, safety and comfort for the newborn receiving phototherapy treatment. FDA regulated and manufactured in the United States.